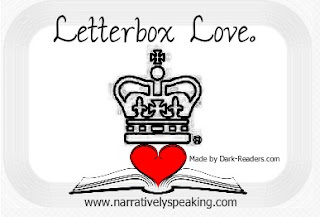 Letterbox Love is a weekly feature that is hosted by Lynsey at Narratively Speaking and is a way for us to share the books that come through our letterbox, galleys and e-books (through our electronic letterbox) and any other bookish goodies that we want to tell you about. *alarm sounds* New Cat Clarke!!!!! eeee, I am so excited for this, it feel likes ages ago since I last read a Cat Clarke book and I love her stuff so I am very excited for this! A Kiss in the Dark is a love story with secrets and lies and as Cat does mystery so well I am very intrigued as to what those secrets are! Thank you Quercus for sending this over! I believe this is a middle grade/young teen book about an irish girl who’s mother dies and she has to go live with her uncle in New York. It sounds pretty good and will definitely give it a go as the lovely folks at O’Brien Press have sent it over. Thanks! I didn’t actually get offered this as such, I was contacted for the blog tour and said yes as I’ve loved every Cat Patrick book I’ve read, then I was told I’d be getting a copy… I don’t know what its even about but like I said, I don’t mind that as I will read anything by Cat Patrick and I’ve heard good things about Suzanne Young. Thank you so much to Electric Monkey for sending this over! The second book from Dawn O’Porter and a follow on from the first, Goose goes back to the lives of Flo and Renee at eighteen, just before they are planning on leaving their hometown for pastures new. I really enjoyed the first book but can’t quite remember the ending so I might have to re-read that before getting to Goose. Thanks Hot Key for sending this over! This sounds awesome, and I have wanted to read it since I got the Chicken House titles back in November. Its about finding your ‘lobster’ or your one true love, and lots of social misunderstandings and losing your virginity. I am seriously looking forward to it cos I imagine it will be brilliantly funny! Thank you to Chicken House and LoveReading4kids.co.uk for sending a copy! I can’t wait to read the new Cat Clarke! I think Lobsters sounds really good too – I’ve seen a couple really positive reviews for that one already! Interesting haul as I’ve never have heard of any of these books, but they sound terrific. I’m so excited for both the new Cat Clarke and Lobsters. The UKYA coming out this year all just sounds so good! Ooh Lobsters! Very jealous. And yay for the Cat Clarke and Just Like Fate. Such good titles. Eek, Cat Clarke! Cannot wait for A Kiss in the Dark – she’s undoubtedly the queen of the YA psychological thriller. I’m really excited about Lobsters, and I also had a copy of Goose arrive this week so looking forward to reading that.